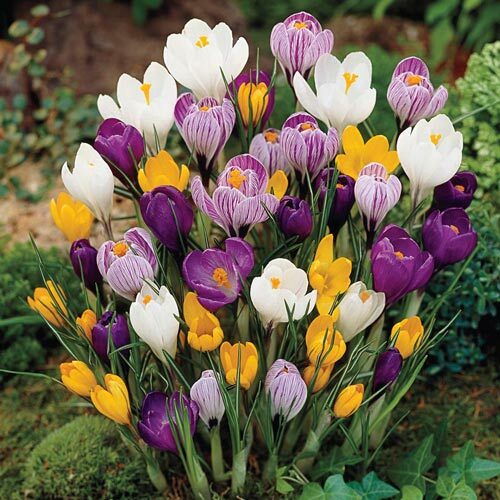 Giant Crocus for Naturalizing | Gurney's Seed & Nursery Co.
One of the Earliest Bloomers! Often the first sign of spring in the garden, Giant Crocus come in a variety of bright colors and really liven up the barren, post-winter landscape. We've selected big, healthy bulbs in a balanced blend of hues for our crocus mixture. Plant them liberally throughout a border, within a sunny rock garden, under trees and shrubs, or in a container, and you'll be rewarded with a mix of fragrant, cup-shaped blooms in the early-spring season. Since they only grow to 6" tall, crocus make a great ground cover planting, too! Easy to grow, they need only well-drained soil and a sunny spot to thrive. Deer tend to avoid. Hardy in Zones 3-9. FoliageNarrow, grass-like borne with or shortly after the blooms. Flower FormSmall cup shaped blooms. Growth RateModerate grow rate. Should grow to full height and bloom first season. CommentsMix generous amounts of peat moss, compost or well-rotted manure into the soil to improve drainage. Remove faded flowers but leave foliage intact until it dies back naturally. Use 5-10-5 fertilizer at planting & in spring. One of the first bulbs to bloom in the spring. In zones 9-10, pre-cool bulbs in fridge (keep fruit in sealed bags) for 6-8 weeks and plant. Lift after foliage dies and store over summer in cool area.